This Cadillac CT6 is a little ways from home. 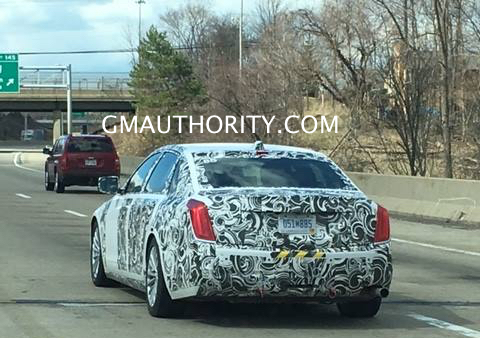 We had been notified of a camouflaged Cadillac prototype outside of Cleveland, Ohio and, after some deliberation, we’ve concluded this is likely a 2016 Cadillac CT6 with European specifications. 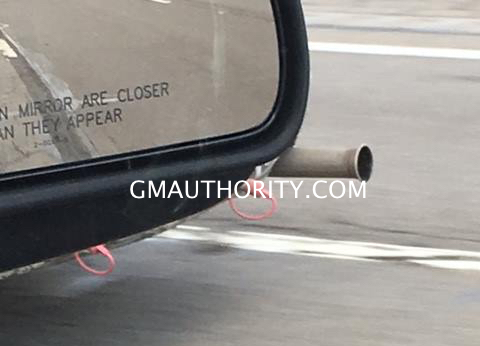 The photos were taken by Cleveland Power and Performance as the CT6 cruised by on interstate 71 south, heading towards interstate 480 east. We agreed on a European-spec CT6 largely due to the mirrors in place. 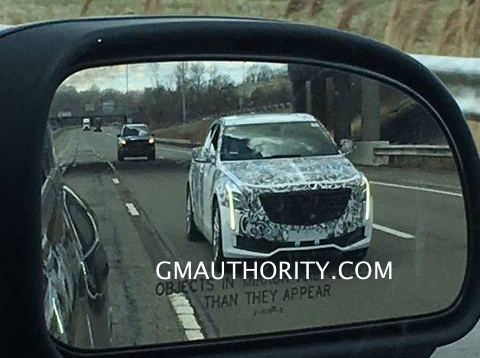 The U.S.-specification Cadillac CT6 receives slimmer, and decidedly sexier, sideview mirrors. This CT6 is wearing much larger units, likely to conform with European regulations for viewing. Other than the mirrors, the CT6 looks largely unchanged, and we’re not aware of any powertrain modifications under the hood. We suppose it’s possible the latest 4.2-liter twin-turbo V8 could be under the hood, or even a diesel, but the jury is out over that. Cadillac has stated it will focus on North American and Chinese market growth before it begins to take the European market by storm, but the CT6’s launch in the old world looks to be inevitable. It’s got only one exhaust pipe, so chances are it’s the base 4-cylinder turbo engine, which would make all sense in the European context. Although the CTS-V 6.2 engine has been approved for use in Europe, I don’t think the 4.2 has been approved. It would take at least 500 sales to make up for the cost of a new engine approval by the European certification authorities. A good move would be to introduce the hybrid version in Europe, which would really make sense from a tax perspective. Selling a Cadillac in Europe is already not easy, since there are much better cars available for less money and more prestige. Selling a Cadillac made in China (hybrids are build China) will be beyond impossible. Yes the 2.0T and the hybrid make the most sense in that market. It is going to be a long and painful road ahead for Cadillac before it can gain traction in the European market. It may never happen but they have to give it a proper try. Twin-Turbo 4.2L DOHC-4v V8 is nice; but if it can’t match the performance of the LT4’s 640 hp and relatively flat power band, you’ve got to wonder whether the new engine is worth the investment. Given the performance numbers of the LGW 3.0L DOHC-4v V6 twin turbo at 404 hp and the LF4 3.6L DOHC-4v V6 at 464 hp, one could estimate a 130 hp-per-liter of displacement meaning the twin-turbo 4.2L DOHC-4v V8 will most likely generate 546-575 hp or well short of the LT4’s 640 hp developed for Cadillac’s CTS-V. These engines are completely different architectures and serve different purposes. The 4.2 is being put in there for refinement. Also, keep in mind they have to leave room for VSport and V models. I also believe JHD has stated that a V series CT6 may not happen. Think of CT6 as the first stepping stone for Cadillac’s future. A V-Sport is likely though. I like to know, how people like you know that it can’t make large amount of power? Seems a lot of work for 5 sales per year. Yes but there is potential there also will help validate the brand if they can have success in Europe competing head to head with the Germans in particular. Let Vauxhall & Opel sell in this market instead, historically they have in the past & been successful at it. They are Europe’s established brands and have what it takes to cut it in this market, even the infrastructure such as established dealers is already here as well. You are right they are more established but Cadillac in Europe is not going to impact Opel/Vauxhall sales in the slightest. No one shopping for an Insignia is going to buy a CT6 instead or visa versa for that matter. By not going after the premium segment GM would be abandoning the most lucrative segment of the market. No one shopping for a 5 or 7 Series is looking at a Opel product as competition. That is the reality. If they do not buy the 5 or 7 Series then they will look at a E Class or A6 instead. Why not give them a Cadillac to consider? Saab was a money pit to end all money pits but having said that I use to like them a lot. Like it or not Cadillac is re-entering the European market in a big way in the next few years. That says that GM does not want to have Opel/Vauxhall try an rival BMW and Mercedes. Right or wrong GM has consistently been about brand hierarchy and Cadillac will always be at the top rung. Opel is a cheap budget brand. The time of senators and admirals is loooooong gone. Nothing at opel is luxury. Nobody cross shops BMW/Audi/Mercedes and Opel. And Cadillac being an American brand, has no chance in Europe. American cars are seen as cheap, plastic, tacky, unreliable cars with zero resale value. And most cars are exactly like that. You don’t want to own a Cadillac beyond the warranty period! Perception will change over time. Cadillac has never given Europe a proper chance with good products, good marketing and the support to back it all up. Cadillac’s being cheap , plastic, tacky and unreliable is just a perception and not based on any quantifiable measurement. I agree that Opel does not have the aura it once used to have, but it’s incorrect to state that Cadillac is seen as plastic and non-reliable in Europe. American cars have however been associated with gas guzzling in Europe for many years, but the local press has been positive about the ATS, CTS, Camaro, Corvette and Mustang (that’s about the list of US cars we can buy in Europe). In fact, most people at work who drive 3 and 5 series BMWs have repeatedly asked me about my CTS. They particularly like the looks and interior, as well as the performance (even with the 2.0T engine – don’t forget BMW in Europe mostly sells base diesels and very few of the V6 or V8 engines they sell in the US). Biggest problem for Cadillac in Europe are missing diesel engines and the lack of an extended dealer network, next to high CO2 exhaust values giving them a tax disadvantage (in the US manufacturers have to limit NOx values whereas Europe is also emphasizing CO2 values, thus making it hard for big engined cars). And as far as warranty is concerned: Cadillac gives 3 years warranty in Europe, BMW and Mercedes only (the legal minimum) 2 years. where are they going to sell it? 70% of the ‘dealers’ on cadillaceurope.com website don’t sell Cadillacs so the information is fake. 90% of those service stations don’t know anything about Cadillac cars, they do just Opels. Those few dealers left (mostly in Belgium, Switzerland) look like crap, they are mixed with Opel. No one with money will ever go to have a look at a Caddy to a place like that. You are right. There is a lot of work for Cadillac to do in Europe in general. There is not one area that does not need improvement. Like I have said and so has JdN that it will take significant time and investment to make Cadillac successful and that success is not guaranteed. Cadillac and GM has to try as they can not simply concede that market. new gm goes better and better and they must do better and better to. and biggest thing what must grov is little things quality and design. enyone not easy eu market or other markets. but gm is more difficult and new born. but gm doing so good work new gm what is amazing. but they must better and better. thats what i think. should be given more time. I think the exhaust in one of the above pictures is of a Euro-spec diesel motor. The shape and size screams diesel powerplant. Well noticed, you could be very right ! Maybe the 2.0 CDTI Ecoflex. the CT6 looks like bar of soap in those pics.